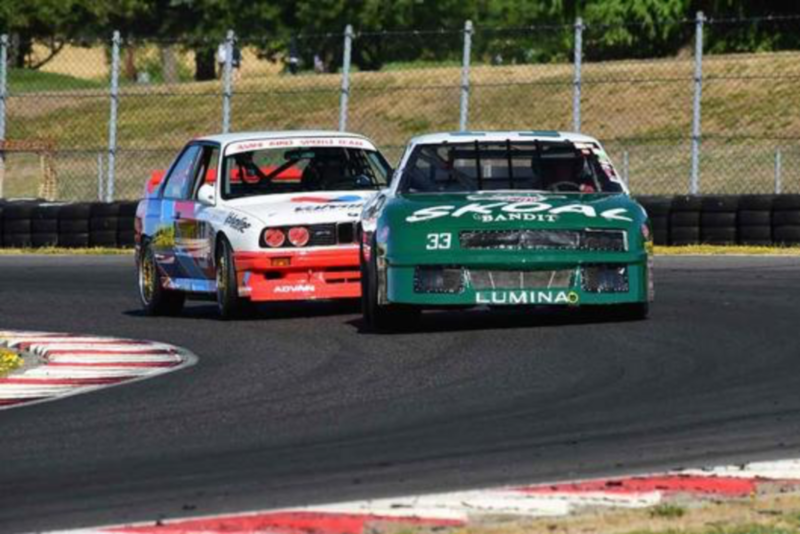 In July I ran my M3 and 2002 at the SVRA sanctioned Portland Vintage Racing Festival. 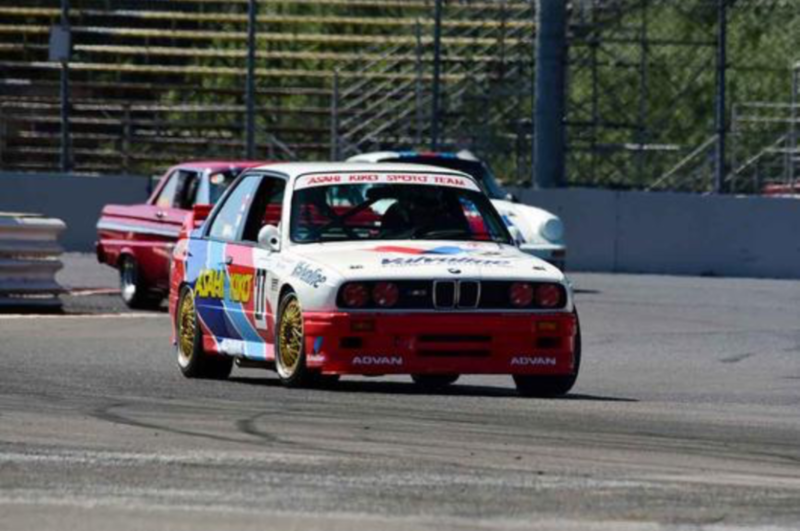 The M3 ran in Group 12A, and the 2002 in Group 8. It’s always interesting to see how the various race groups are made up. 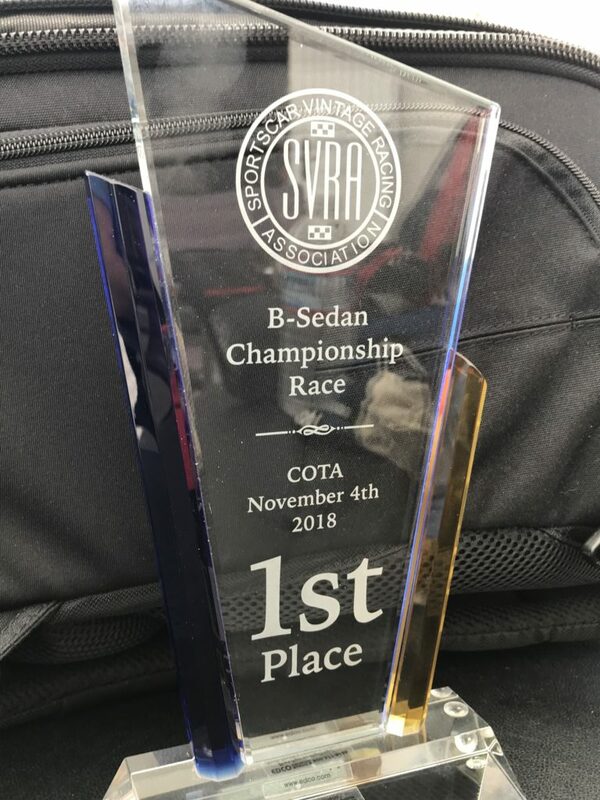 The sanctioning body, in this case SVRA, tries to make up the groups as best as it can from the entries they receive for an event. Sometimes vintage racing makes for some strange bedfellows. For this weekend Group 12A had a real mix of interesting cars. 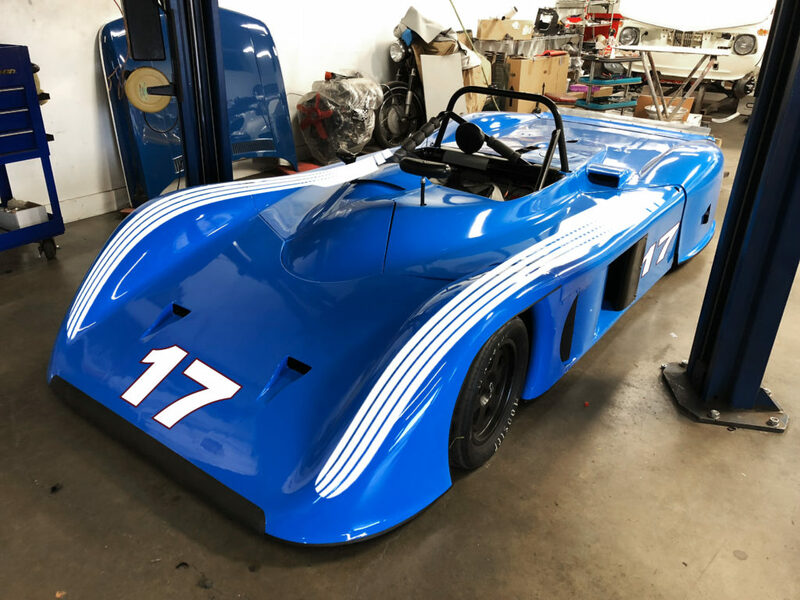 There were some Big Block Corvettes, Cobras, Trans-Am sedans, NASCAR cars, along with a couple of prototype cars, tube frame GT cars, and my M3. On Saturday’s Qualifying race I qualified 7th and had a great race with Cameron Healy in his RSR Porsche. We ran nose to tail until he had a motor issue and had to pull off. I finished 4th. For the Saturday Feature race I had to make a good start as I was surrounded by big block cars. The M3 is very quick but it does not have much torque so I was worried they would get the jump on me going down to Turn 1. Was able to keep them behind me and went on to finish 4th with my best lap of the weekend, a 1:24.9. 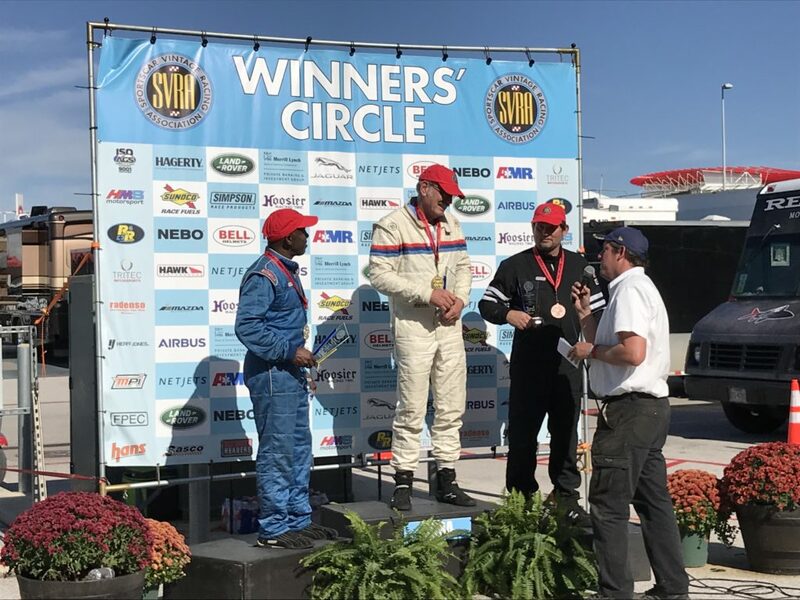 The M3 finished 3rd over-all, and 1st in class in Sunday’s Feature Race. Jim Froula, who won on Saturday, didn’t start on Sunday so I started 3rd behind a 427 Corvette and a 427 Cobra. Outside of me was the #33 Skoal Bandit NASCAR Lumina. Again I had to make a fast start or they would eat me alive before we got down to Turn 1. 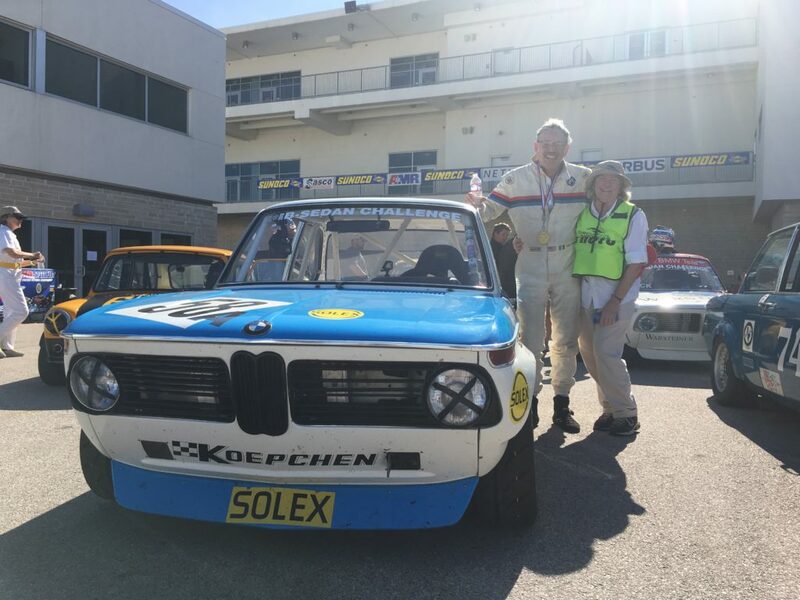 I am able to hold off the Lumina and finish 3rd over-all, and 1st in class with a best lap of 1:25.1. My 2002 ran in Group 8. this is a really fun Group to run in. 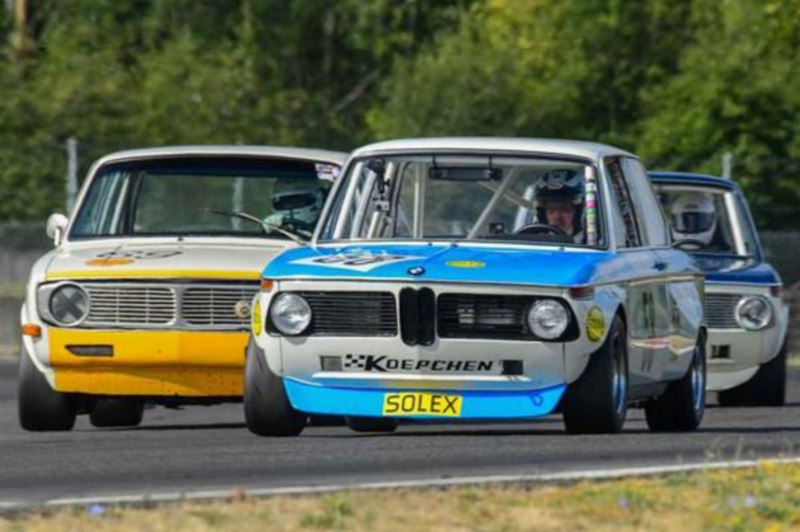 It is made up of mid-bore sedans and sports cars so there is always close racing. Hans and I race together a lot. He is a good clean driver and we enjoy racing against each other. For the Feature race I started 9th. The first lap was pretty wild and woolly! 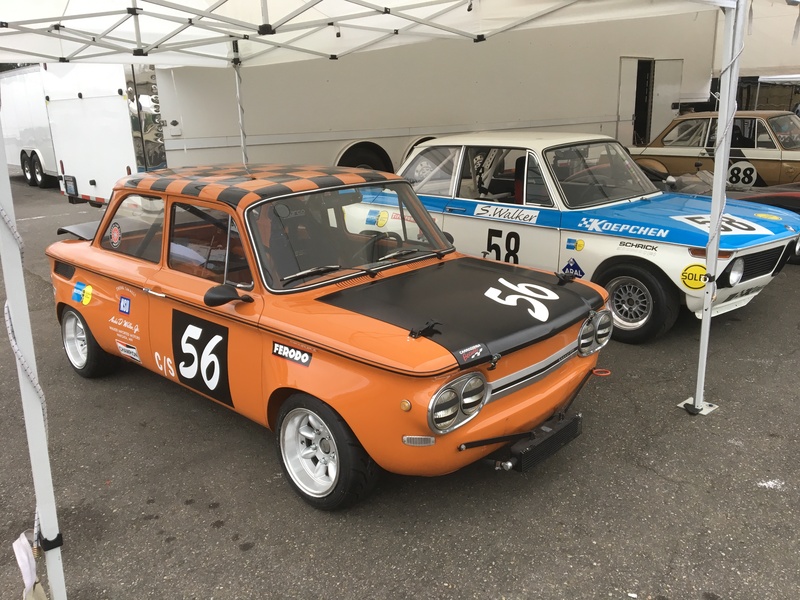 I was gridded inside my old friend Hans Guttman in his 242 Volvo and just behind Paul Gladio’s 911. 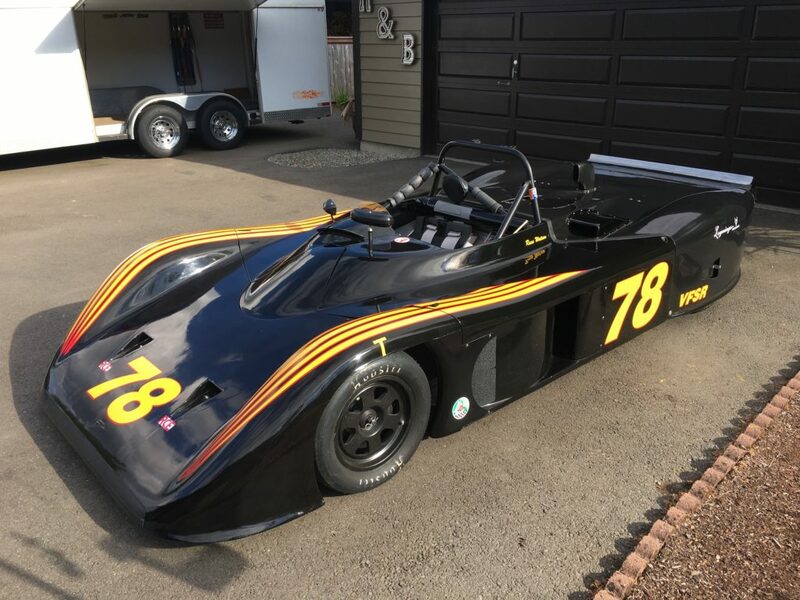 There was also a bunch of Lotus 7’s in the mix. We swapped places back and forth for the entire race. It was a lot of fun. I ended up finishing 9th over-all and 3rd in BS with a best lap of 1:29.5. Here’s the video, hope you enjoy it! 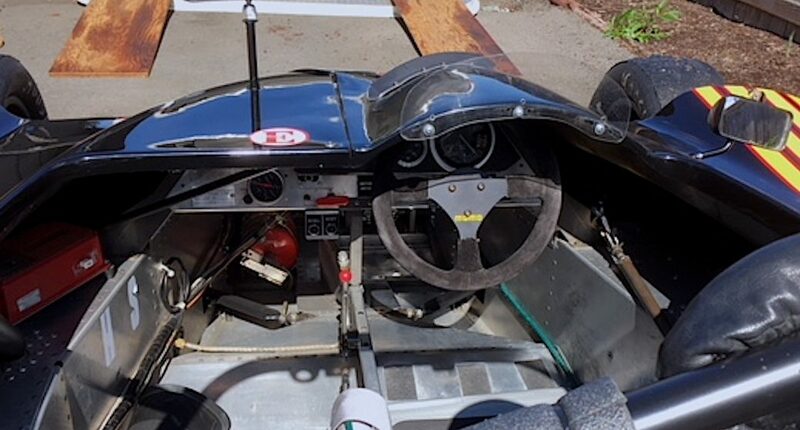 I have always felt like I had some unfinished business regarding the beautiful Chevron B16 I sold. I never felt like I got the most out of the car because I was never completely comfortable in it. I guess trying to stuff my 6′ 3″ into a space designed for someone 5′ 10″ had something to do with it. If you look closely at this image you will see that my helmet completely fills the Gurney Bubble in the window above my head. That meant that my head was about 3-4″ above the roof line of the car. 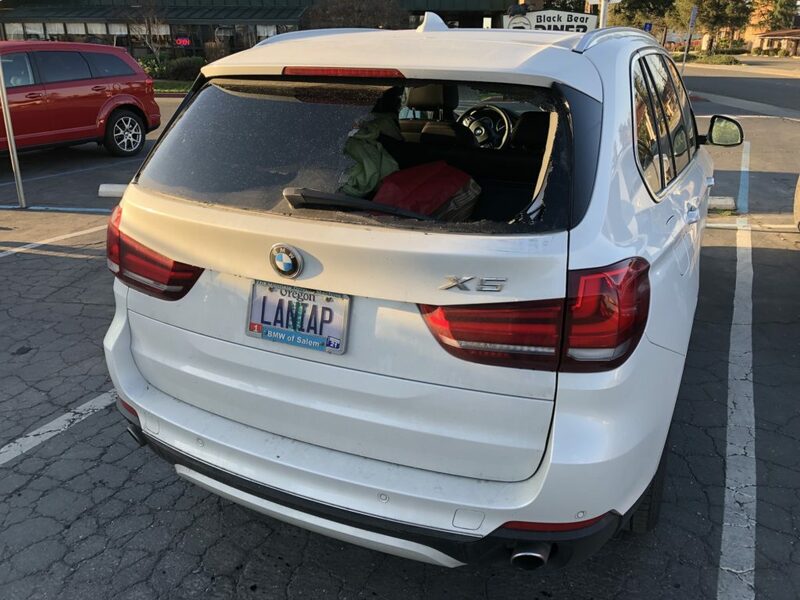 This was in spite of taking the padding out of the seat and spacing the window open 1″ more than stock. At my other end, my feet were too large to fit comfortably in the pedal box. I had to really do an awkward dance to work the pedals. Heel and toeing was difficult at best and I would occasionally miss shifts because of this complication. After talking with Jim extensively about cars/classes/options I settled on a S2000 class car to replace the Chevron. S2000s are relatively inexpensive to buy and pretty inexpensive to operate, but are every bit as quick as the B16. 1986 Swift DB2 fitted with DB5 bodywork. After some searching I bought a car from Tacoma, WA. 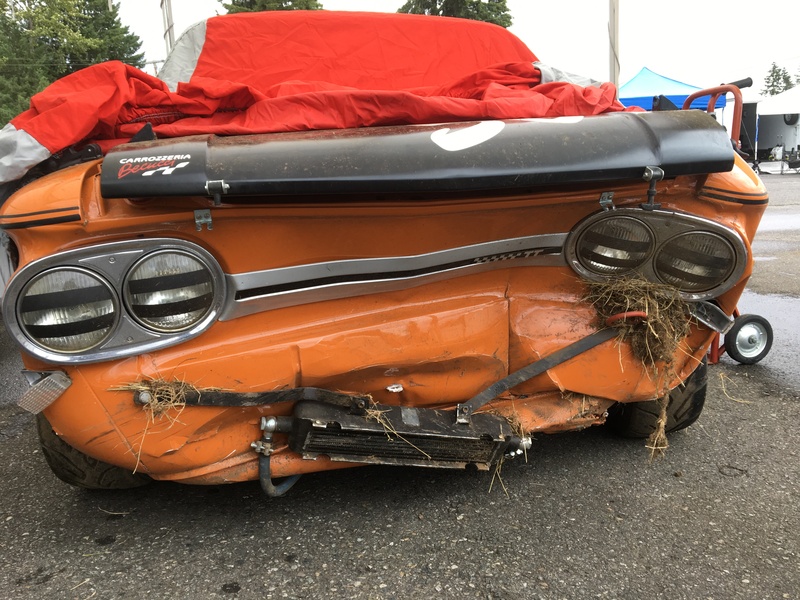 It had a good history, having run in the American City Racing League for many years. 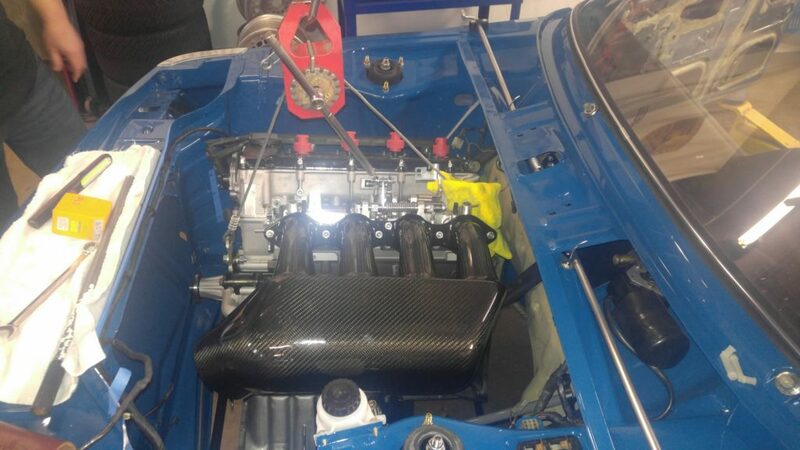 Having run in the ACRL meant that it had the Cosworth 4 valve, twin cam head on the Ford Pinto based 2 liter engine. 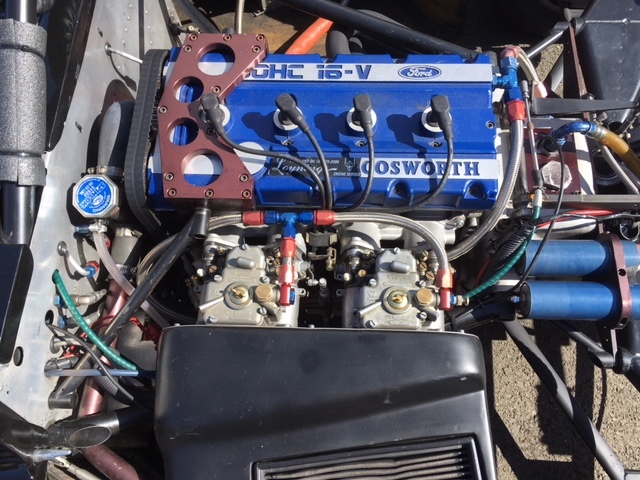 The Cosworth 2 ltr. Ford. 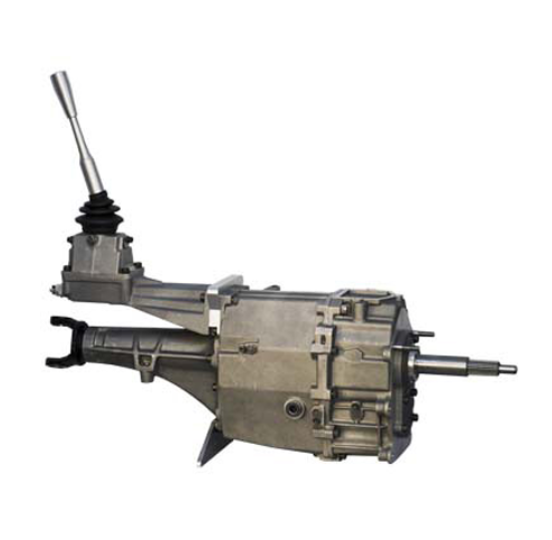 This engine features the twin cam, 4 valve head and makes about 220 hp. The first thing you will observe is that I have a lot more headroom in this car compared to the Chevron. The former owner was 6’3″ tall like me so the car is already set up for someone my size. My new Swift arrives at Racecraft’s shop. 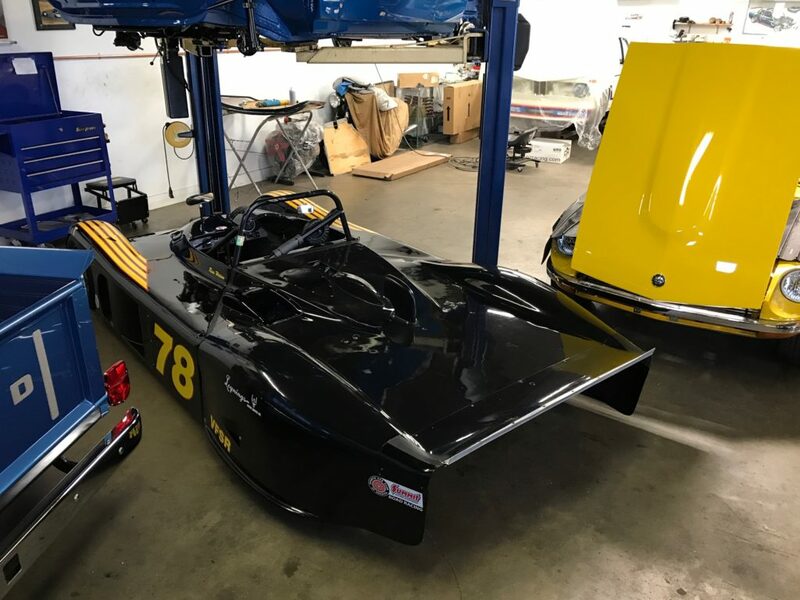 The car arrived at the Racecraft shop where Jim and Co. will give it a thorough going over prior to our first event in the spring. I have also commissioned a new wrap for the car as black has never been my favorite color for a race car. I will post additional pictures once it is ready to rock & roll. 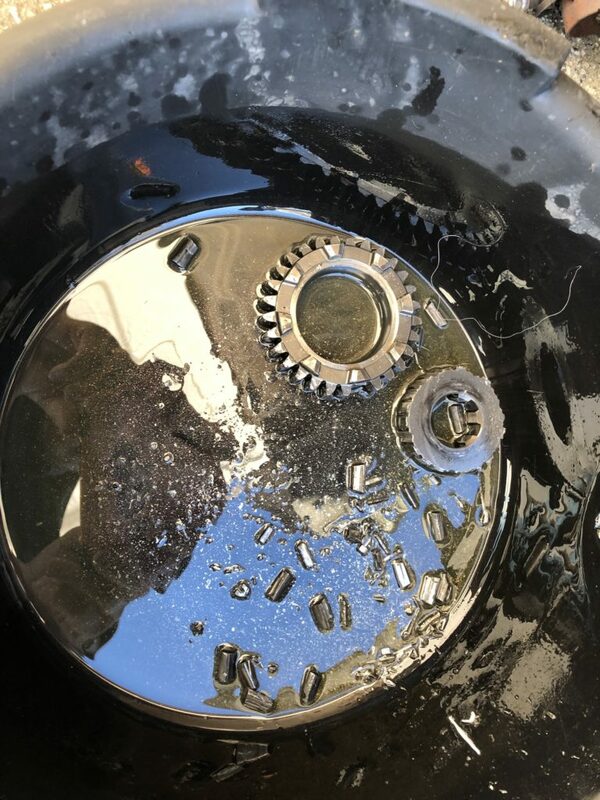 The M3 quit itself well until the block cracked. 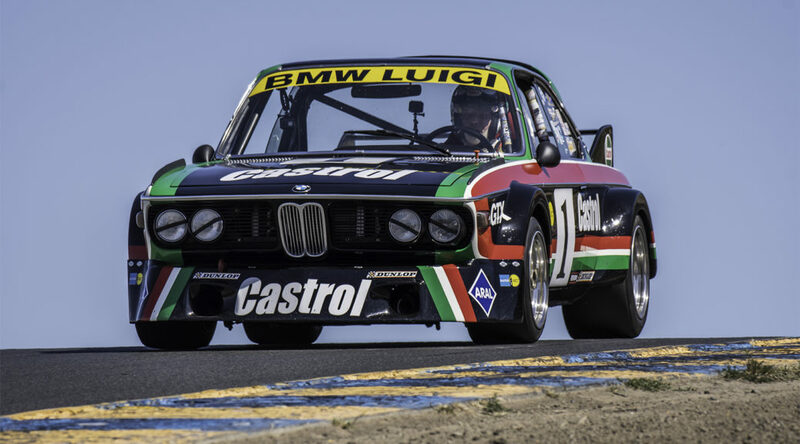 In August we made our annual pilgrimage down to Monterey for Car Week. With only 2 cars entered in the Rolex Races we looked forward to a relatively quiet week. The featured marque this year was Datsun. 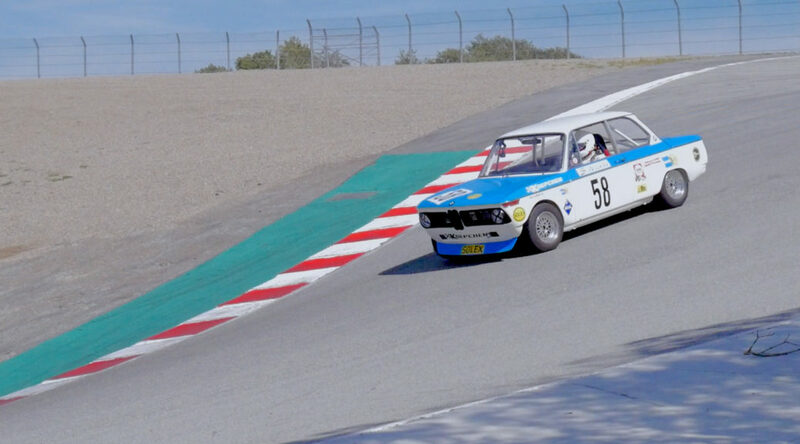 In the program they had a picture of John Morton’s BRE Datsun 510 racing at Laguna Seca in about 1971-72 and coming into the frame is my #34 BMW 2002 when it was raced by Hyde Park Motors. Pace lap from the 2.5 Trans-Am race at Laguna Seca in about 1971-72. The orange and black BMW is my #34 Hyde Park Motors car being driven by Carl Fredricks. 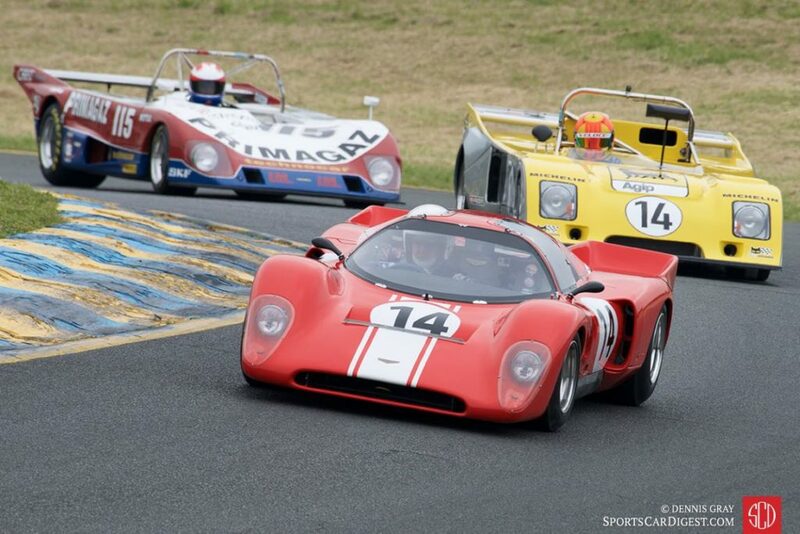 I also had consigned the Cobra I took in trade for the Chevron B16 with Russo & Steele. The car went across the stage on Friday night but barely reached the reserve I had on it. I decided to drop the reserve at the last moment so the car went to a new home. I didn’t get what I hoped for, but we also didn’t have to pay to haul it home. 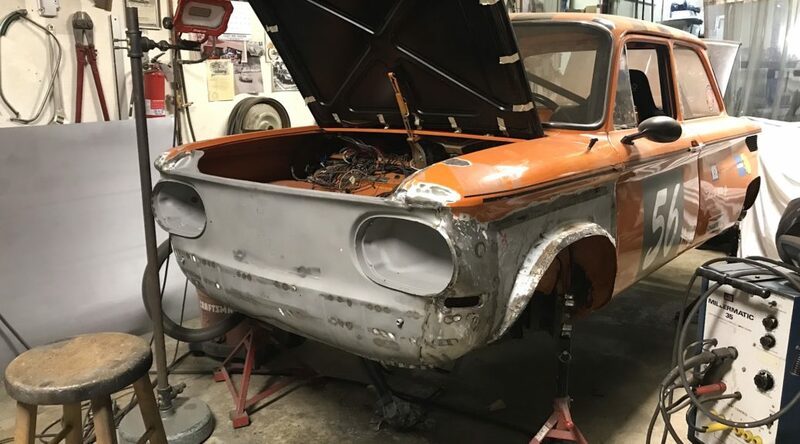 Auctions are a crap shoot! 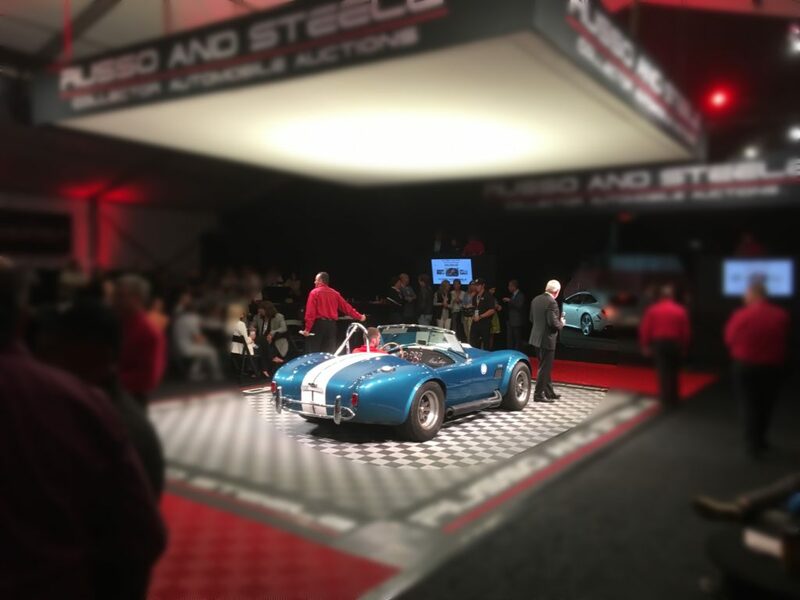 The Cobra crosses the block at Russo & Steele on Friday night. Not what I hoped for. 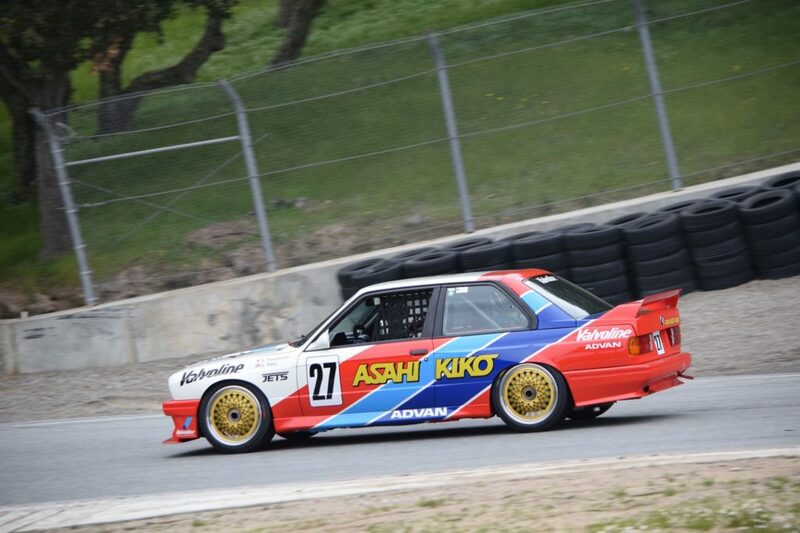 As I said, I had 2 cars entered in the Pre-reunion races as well as the Reunion Races. 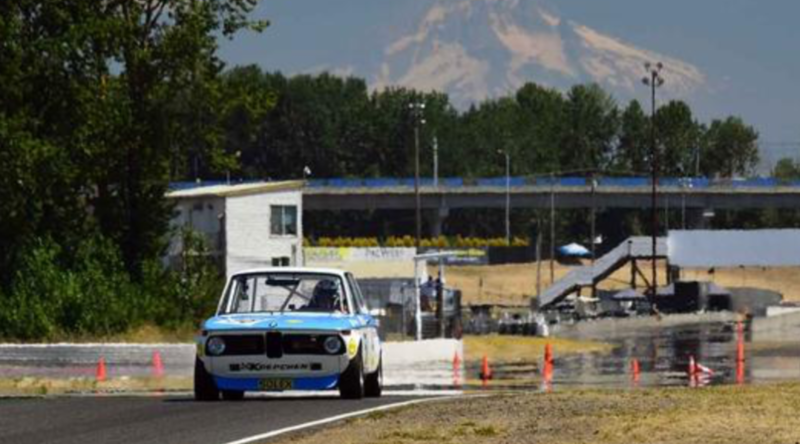 During the Pre-reunion races the right front strut mounting broke in the CSL when I was forced up onto the cement berm on the inside of Turn 6 by a slower competitor that didn’t see me. The problem didn’t show itself until the Saturday morning race the following weekend. The result was that we had to park the car. 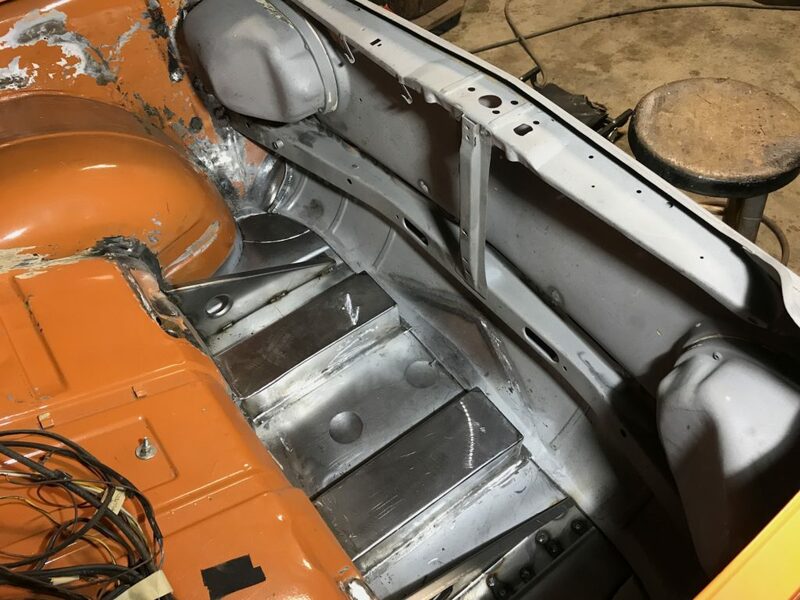 It is not a difficult fix but Jim & Terry didn’t have what they needed to accomplish it. The M3 ran flawlessly during the Pre-reunion weekend. The car was in the group with the GTO and IMSA GTP cars. I spent most of my time watching my mirror as the GTP cars closed very quickly from behind. Still, I managed to finish 13th in the Feature race during the Pre-reunion weekend after some great racing with Phil Mendelovitz in his Datsun 240 SX GTU car. 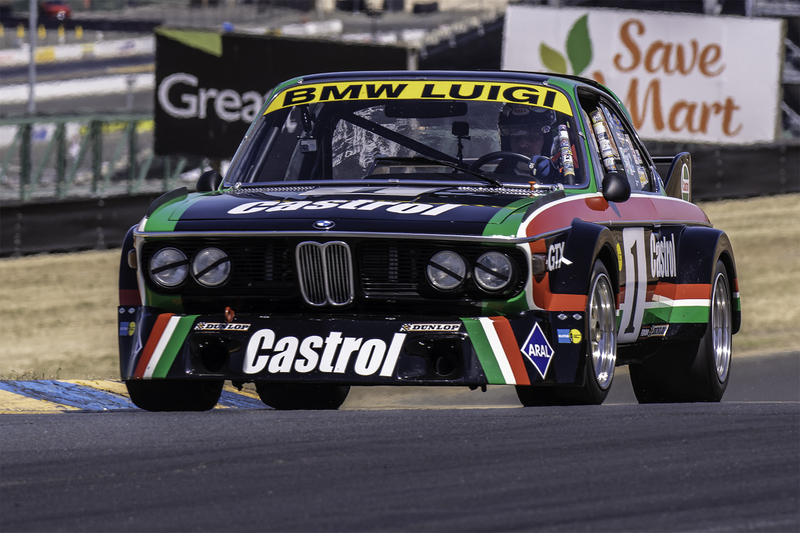 For the Reunion Races SCRAMP allowed me to move from the GTO/GTP Group to the same group the CSL was to have been in. They even let me start where my lap times placed me in the group. I had a great race going with Richard Goldsmith in his Dekon Monza until I started smoking heavily. It turns out there was a large crack in the block that developed and oil was seeping out onto the headers. 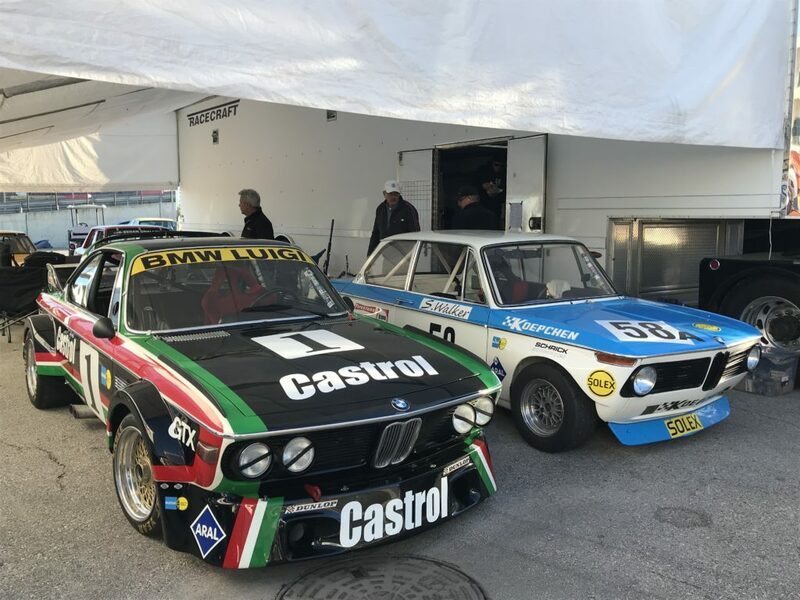 Last weekend we travelled across the country to participate in the 2018 Classic Motorsports ‘The Mitty’ races held on the beautiful Road Atlanta circuit just north of Atlanta, Georgia. 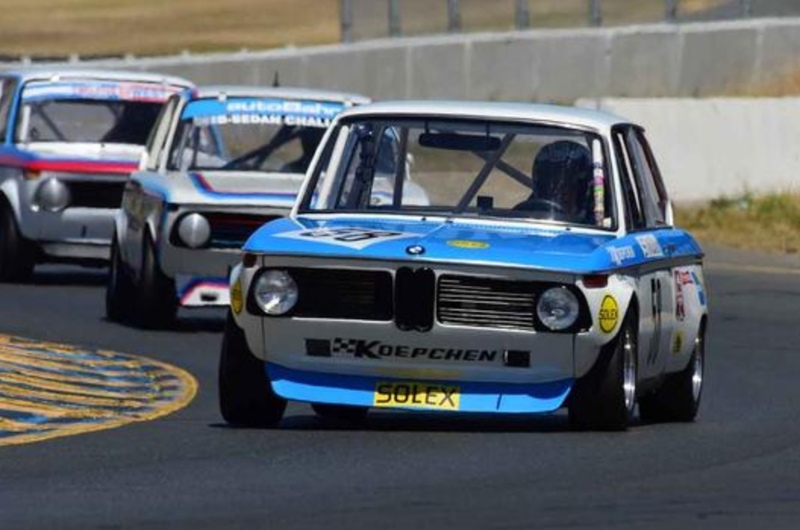 This is perhaps the biggest vintage race on the east coast with over 300 entries. 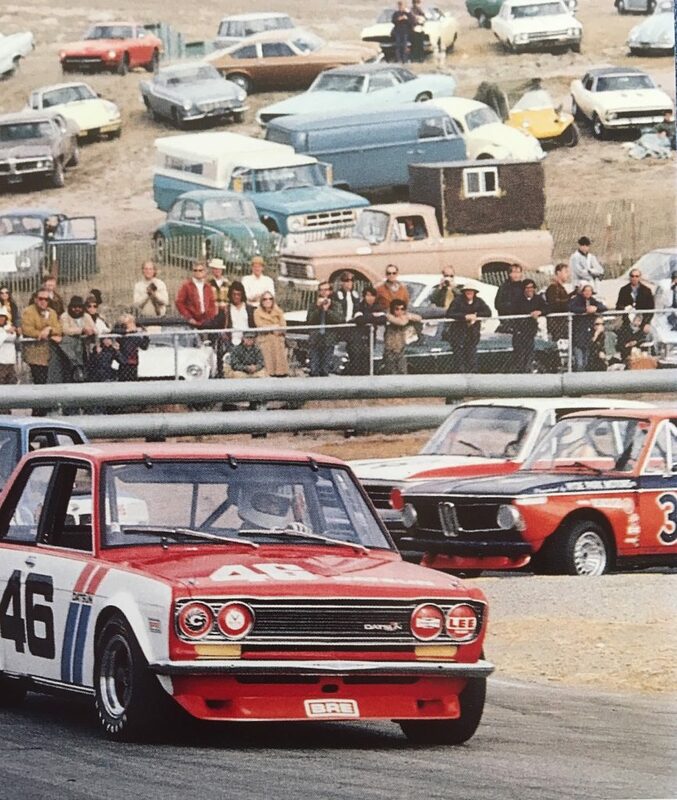 The featured marque for this year’s race was Nissan/Datsun so the paddock was full of 510’s and Z cars. 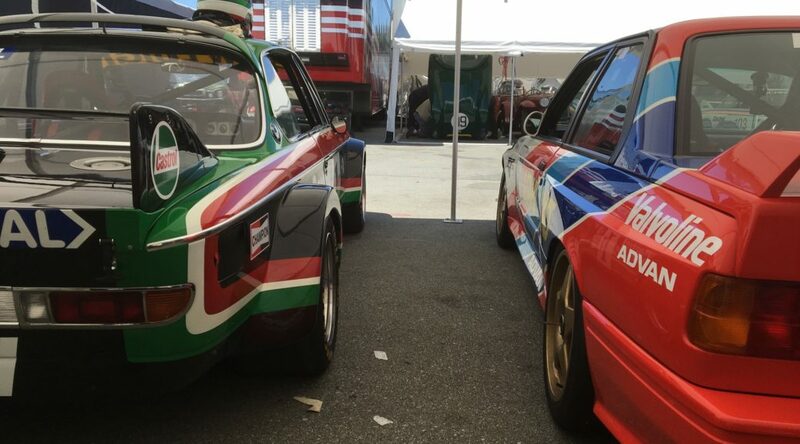 My 2002 was the token German in our paddock, which was also home to the cars of John Morton, the Grand Marshal for the event, and Adam Carolla. #34 was the token German in a sea of Datsuns. Our weekend began on Thursday with the red-eye flight from Portland to Atlanta. With only 4 hours of troubled sleep our next challenge was morning rush hour traffic up I-85 through the heart of Atlanta. YUK! 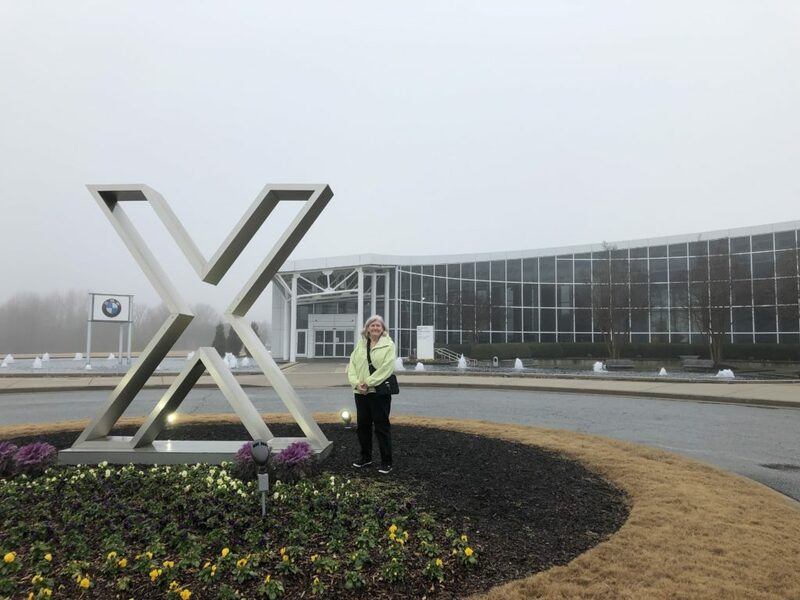 We had been invited to visit the BMWCCA Foundation Museum which is located across the street from BMW’s mega-plant outside Greenville, SC. The museum is preparing to open their new exhibit called “The Icon,” to commemorate the 50th anniversary of the introduction of the 2002. My car was invited to participate in the exhibit. I had shipped it back to SC a month or so ago and was excited to break it out for the weekend to go racing. 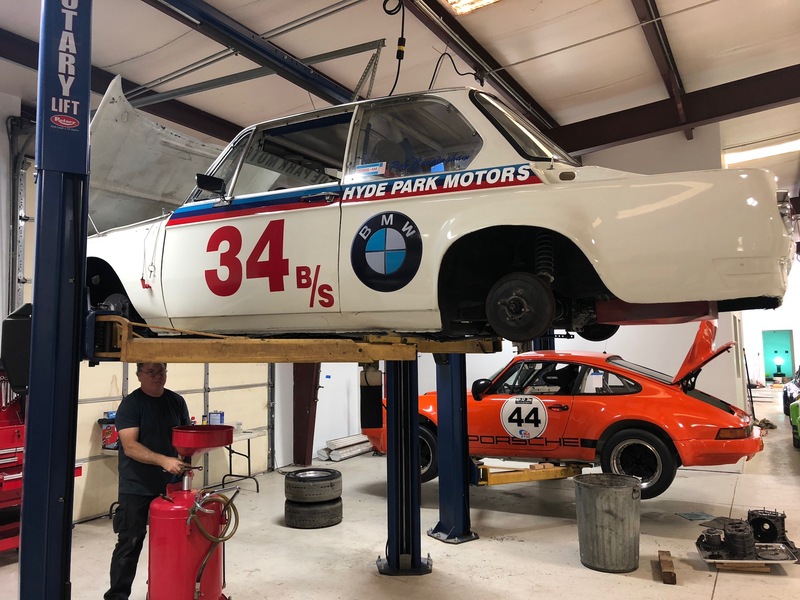 #34 getting a full race prep at Vintage Racing Co. under the watchful eye of Michael Eberhardt. 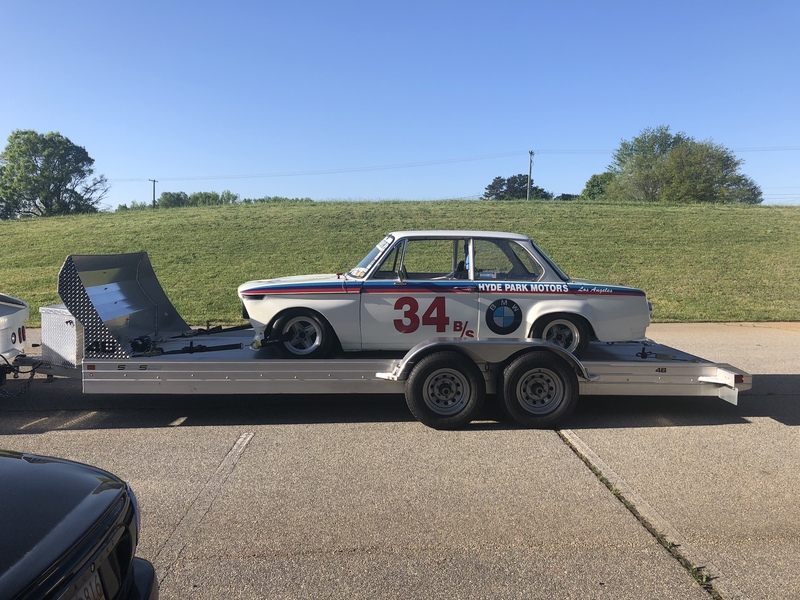 I found a local race-prep shop, Vintage Racing Co., to transport the car from the museum to the track and to do a race prep on the car. The owner, Michael Eberhardt, was incredibly helpful and competent. Our visit to the museum was great. We met the curator, Michael Mitchell, who is responsible for putting the exhibit together, as well as Scott Dishman, the Director of the Foundation, and Jackie Bechek, who is on the Board of the Foundation. We toured the facility and saw how the exhibit is coming together. There are 24 other significant 2002’s being readied and set in place for the exhibit. 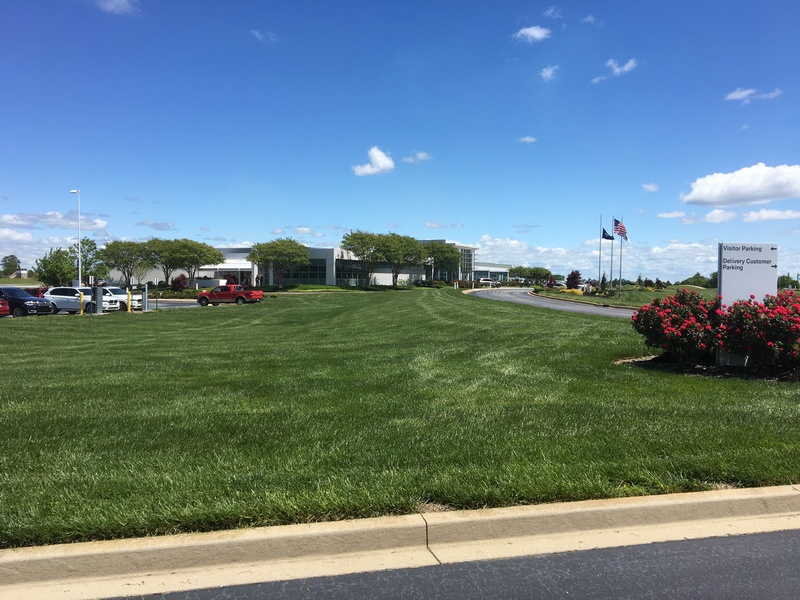 Around the outside are photo’s, paintings, dealer signs, and a wide array of memorabilia associated with the development, manufacture, and introduction of the 2002. The exhibit is scheduled to open on May 18, 2018. The BMW Performance Driving Center. Following the tour we were taken across the street to have lunch at the Performance Driving Center. Our lunch included a quick tour of the school and a ride around the track in a M2 with Mike Renner. 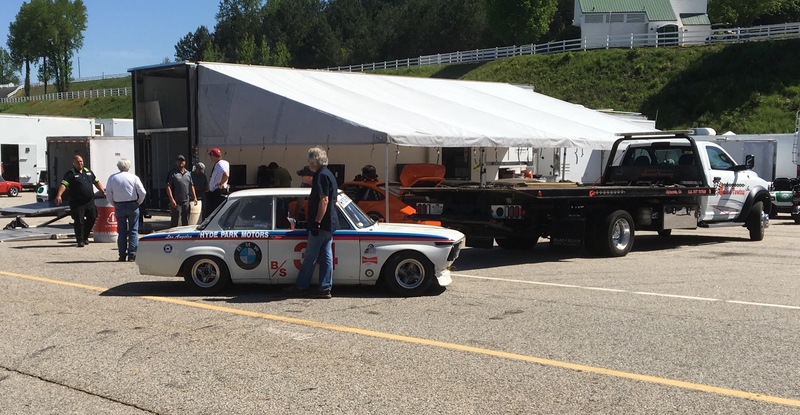 It was time to head back down to the track and get registered for the weekend and find our car in the Road Atlanta paddock. 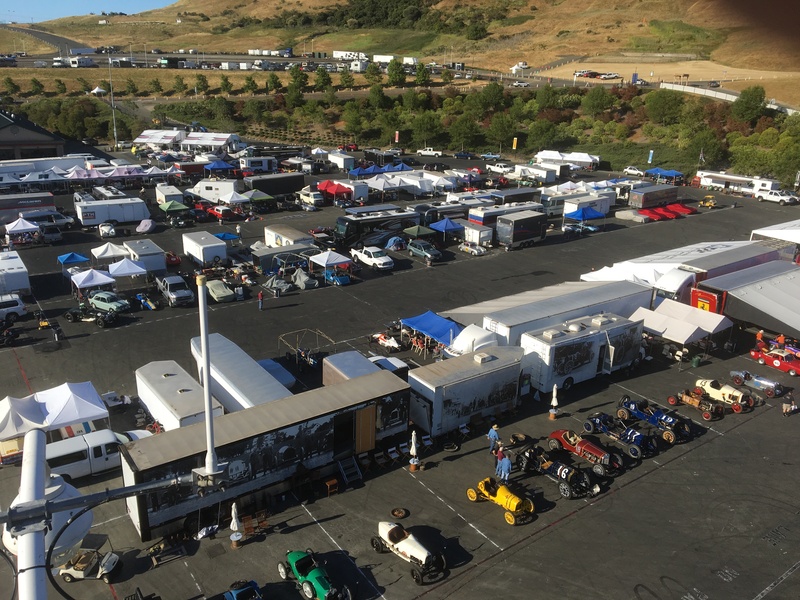 Because of the huge number of entries HSR was utilizing both paddock areas at the track. The Racecraft truck was located in the Pro paddock on the inside of the Start/Finish straight. Thursday morning began at 7:20 AM with a quick driver’s meeting. 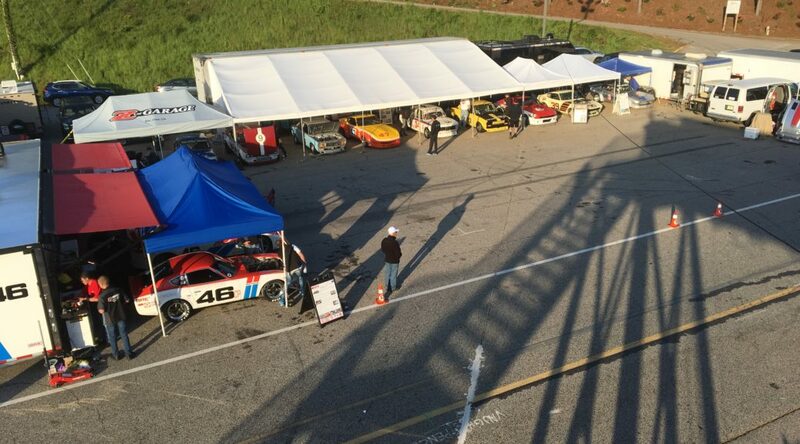 Since I have never driven Road Atlanta I had signed up for the Track Orientation Program. This program, run by Jim Davis, started with a van tour of the track. Jim talked us through car placement, turn-in points, landmarks, and a host of other helpful information. Following the van ride the TOP group had their own test session on track. Jim’s tour was very helpful, but there is nothing like logging laps in your own car to learn a new circuit. 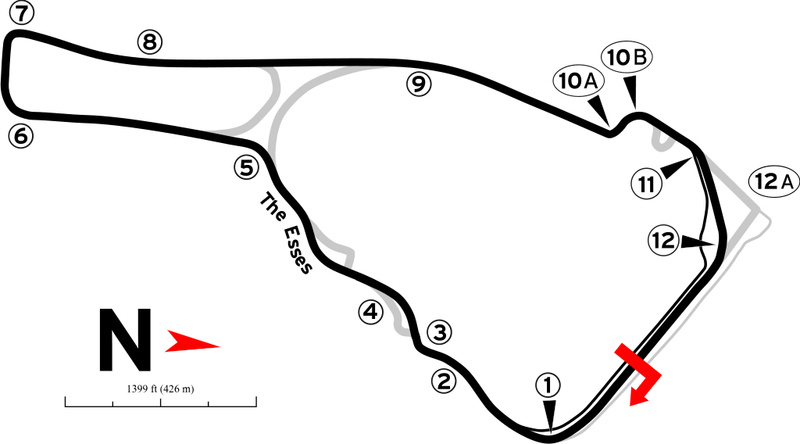 Road Atlanta has several blind turns, most notably Turn 11. You approach the turn from one side of a steep hill, and then crest the hill and turn while passing under a bridge. 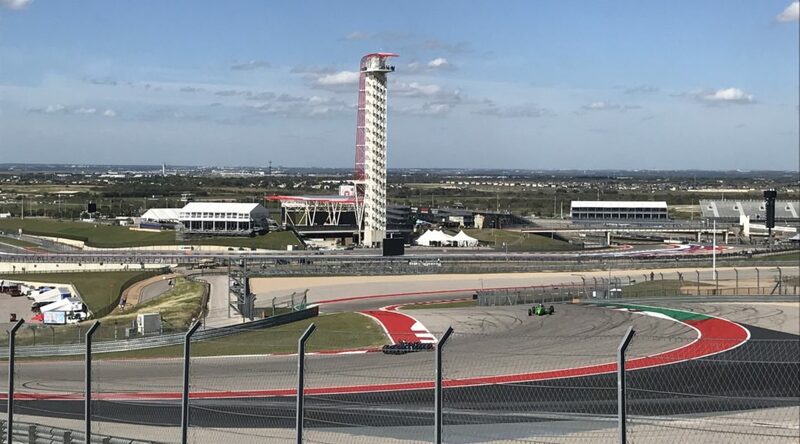 The back side drops steeply while still turning down to the very fast Turn 12. On my first lap I followed another BMW that drove straight off the track his first time through Turn 11. I almost followed him, but was going slowly enough to turn and stay on track. Believe me, television does not show how steeply the track drops as you plunge down to Turn 12. On Friday our group had 2 practice sessions. My lap times got better each session as I gained confidence and familiarity with the track. My best lap in the first session was a 1:50.7, and 1:48.8 for the second session. In the afternoon they put several groups together for a sprint race sponsored by Sasco Sports. It was a large group of over 50 cars, and I started 31st. The race was only 8 laps and with that many cars on track it was very hectic the entire race. I managed to pass a few cars and finish 28th with a best lap of 1:47.9. I will say that the racing is more aggressive than we have on the west coast. I had a Porsche dive bomb me turning into turn 3 several times, as well as a few cars that blocked as I was trying to pass them, even on the straights. Fast and technical. The Esses are also quite a challenge. On Saturday we had one Qualifying session in the morning and a sprint race in the afternoon. 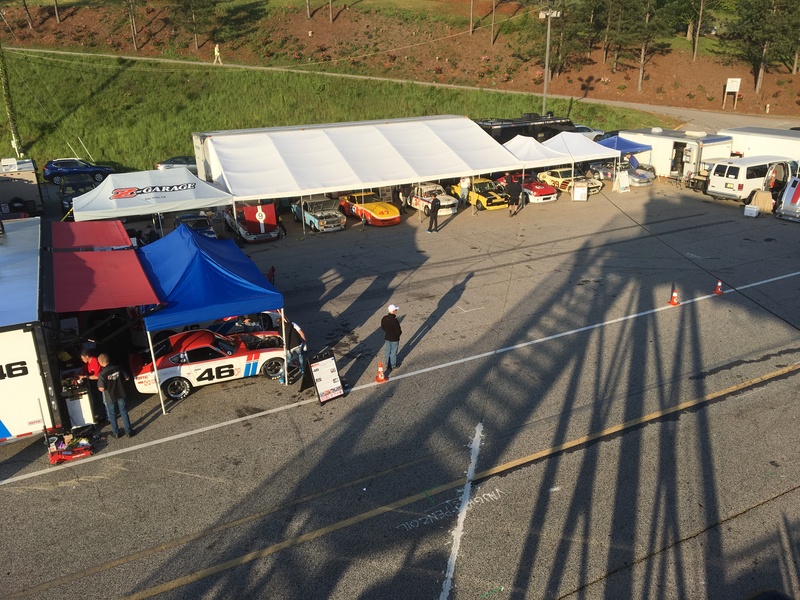 I was able to get my lap time down to 1:47.0 in the morning session which put me 32nd on the grid out of 44 cars. I was happy that my times were still improving, but not so happy to be buried so deeply in our group. The race went better than I thought. I passed 6 cars in the first couple of laps, but got blocked by a lapper on the last lap and finished 28th with a best lap of 1:46.8. Considering the higher afternoon temperatures and some grease on the track from all the cars running, I was pretty happy with that. We only had our feature race on Sunday. Several cars in our group either broke or left early so we had 21 cars take the green flag. I started 13th and again passed several cars in the opening laps. After 4 laps I found myself right behind Jim Froula in his 240Z and was able to stay with him until the checkered flag for a 9th place finish, and a best lap of 1:45.6. I’ll be posting the video in a few days. Michael and his crew get ready to load #34 for the trip back to the museum. 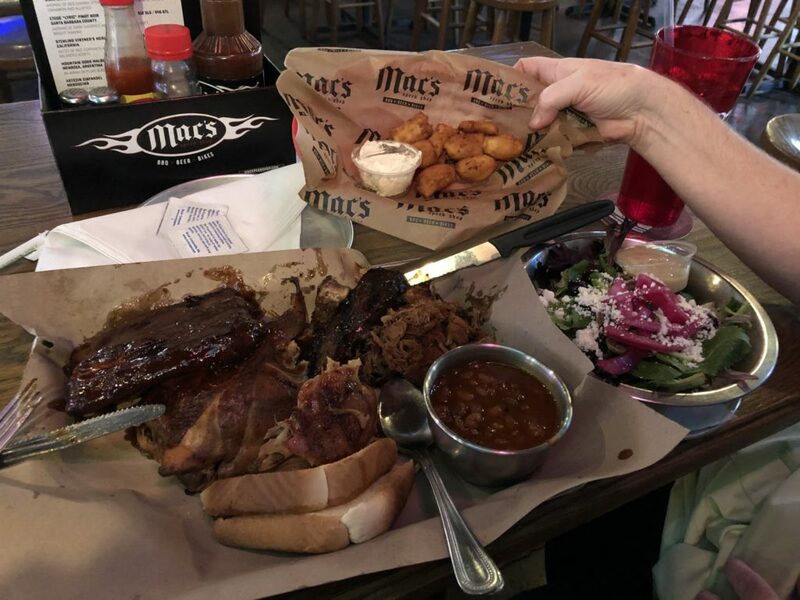 Both Mary and I really enjoyed the weekend and our time in the Atlanta area. The people were warm and friendly, the weather was perfect, and the BBQ was spectacular. Road Atlanta has been on my list of tracks that I wanted to drive. It is fast, technical, and intimidating, but rewards lots of laps and familiarity. The best part of the weekend was the fact that #34 worked flawlessly all weekend, and was driven onto the truck on Sunday night with no issues. He will get a well deserved rest in the BMWCCA museum until next January. 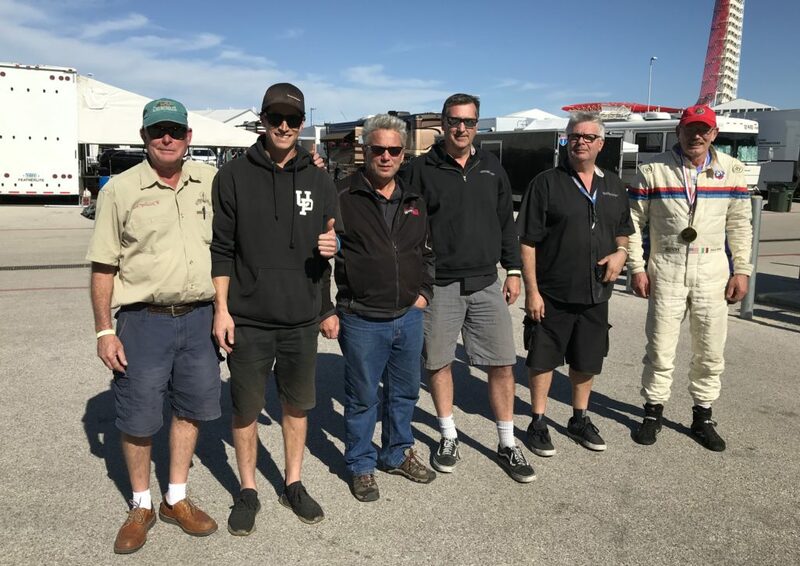 I want to thank Scott Dishman and Michael Mitchell for their help and hospitality; Michael Eberhardt for his help and expertise; and David Hinton at HSR; and Jim and Austin from Racecraft. Without these folks we couldn’t have done the event.